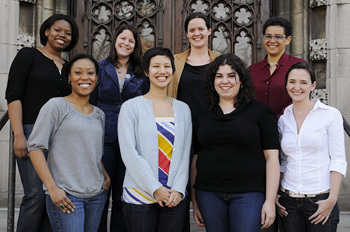 Based out of the University of Chicago since Fall 2003, Mapping the Stacks (MTS) is led by Professor Jacqueline Goldsby of the University of Chicago's Department of English. Recognizing that the city of Chicago is teeming with archives devoted to mid-20th century African American life but that these institutions and organizations often lack the staff and funding required to keep their collections fully accessible to the public, MTS aims to bridge this gap. Thus far, MTS is cataloguing collections at the Chicago Public Library, Carter G. Woodson Regional Library, Vivian G. Harsh Research Collection of Afro-American History and Literature; the DuSable Museum of African American History; the Chicago Defender newspaper; and the South Side Community Art Center. An important collaborator is the University of Chicago Library, whose Special Collections Research Center's archivists provide instructional training to the MTS staff. The SCRC staff members participating in MTS training are: Maija Anderson, Patti Gibbons, Kathleen Feeney, Eileen Ielmini, Daniel Meyer, Cheryl Oestreicher, Alice Schreyer and Robin Secco. Funding from the University of Chicago's Center for the Study of Race, Politics & Culture, Division of the Humanities, Commonwealth Edison, and the Andrew W. Mellon Foundation supports MTS' work.